Spring is gone and blooming violets in the valley are past, but mountain violets still abound. The yellow grow most abundantly, covering clearings in meadows and gracing banks along the dirt roads. But, if you look carefully, sweet and tiny lavender violets can be found. They grow in interesting places, like at the edge of a dirt bank, or beside a rotting log. Their blossoms are as tiny as your littlest fingernail, but so sweet to behold. It's interesting to learn about the meaning of flowers. Violets represent such desirable qualities. Representing humility, the blue or purple violet speaks of faithfulness and loyalty. The yellow violet specifically illustrates the chance for happiness in life. Ancient Roman legend tells of beautiful maidens whom cupid announced as more beautiful than Venus. In her anger, Venus beat these maidens until they turned blue and were transformed into violets. Such a sad story, when you think about it. I prefer the image of God creating these gentle flowers in the beginning and the idea that Adam and Eve named them violets because the pretty name went so well with this sweet flower. Legend says that if a person dreams about violets, they will move forward with success in life. And violet flowers are always considered a symbol of blessing for any woman. 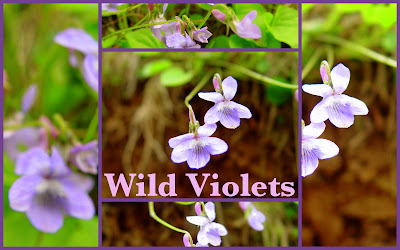 No matter what the legend or blessing, violets are sweetest of the sweet when it comes to woodland flowers. Little violet nosegays are a joy to behold! Can anyone rem w me the lazy days of summer in the forties and fifties [yeah!] when you roamed the fields, pastures, woodlands and played games on the railroad track? It was during those carefree days that i always recall discovering VIOLETS IN THE WOODS..Not even An Orchid can compare with that beauty. Jonell, I remember the fields, pastures, and woodlands --- searching for wonderful, tiny flowers --- but 'twas past the 40's and 50's for me. Thanks for linking Gracious Hospitality to My Gramma's House! I will search for just the right flower picture to click on! Violets are so precious. I have a large pot of them that blooms every spring. But they are gone so soon and I wish they would come again. The root system in the pot is so entwined, it is amazing. For such a small and delicate flower, it has alot of roots. They are beautiful and I enjoyed reading more about them. They're beautiful. I've always loved violets...the color just seems happy. Content.